WE ONLY PURCHASE ALREADY FORECLOSED HOMES WITH 35%-65% LTV. YOUR MONEY IS LOW RISK WITH GREAT GAINS! INTEREST ONLY MONTHLY PAYMENTS AT 12.5%, 2 YEAR BALLOON. OUR PRIVATE LENDERS ARE EAGER TO GET THEIR MONEY BACK OUT WITH US AGAIN. THE TOTAL GAIN IS GREAT WITH A MINIMAL RISK AS THE REAL ESTATE SECURES THE NOTE. IN THE GROWING REAL ESTATE MARKET WITH AN INCREASING NUMBER OF INVESTORS AND BEGINNER INVESTORS THE AVAILABILITY OF VIABLE HOMES HAS BECOME SCARCE. TO ENABLE OTTO E. BEYER THE COMPETITIVE EDGE NEEDED TO GET THE CONTRACTS, HE HAS DEVELOPED A CONGLOMERATE OF PRIVATE INDIVIDUALS INTERESTED IN EARNING HIGHER INTEREST RATES THAN ARE AVAILABLE AT LOCAL BANKS AND STOCK BROKERAGE FIRMS. PRIVATE MONEY ALLOWS US TO WRITE A CONTRACT THAT IS FINANCING WITH NO CONTINGENCIES AND TO CLOSE IN 3 TO 4 WEEKS. THIS IS A DETERMINING FACTOR WITH SELLERS ALLOWING US TO RECEIVE APPROVAL ON THE CONTRACT OVER THE OFFER NEEDING FINANCING. 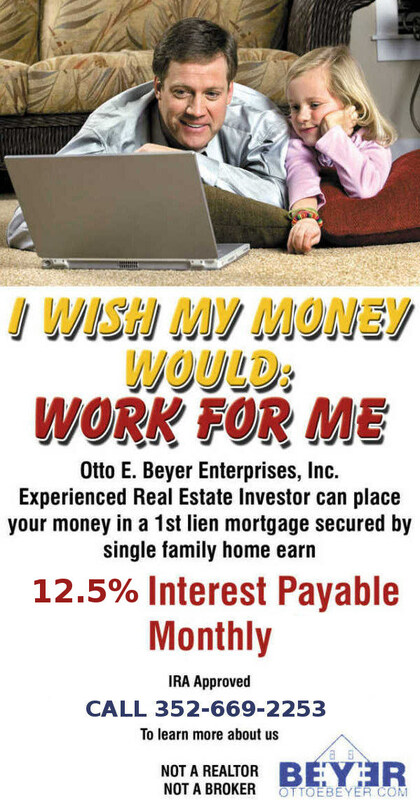 OTTO E. BEYER THE PRESIDENT HAS BEEN IN THE REAL ESTATE INDUSTRY FOR 30+ YEARS. HIS EXPERTISE HAS GROWN THE COMPANY FROM 18 HOMES TO A PORTFOLIO AVERAGING 120 HOMES. OUR PRIVATE INVESTORS LOOK AT DOCUMENTATION OF THE VALUE OF THE HOME, COMPARABLES IN THE AREA AND OUR TRACK RECORD. WE HAVE NEVER HAD AN INVESTOR NOT PUT THEIR MONEY BACK OUT ON ANOTHER DEAL.